Brush cutters are some of the most useful garden tools – no argument about this! The clearing saw is more effective than a rotary mower or lawn mower in clearing small, trees, foliage and weed. However, their effectiveness has a lot to do with the serrated blade attached to it. 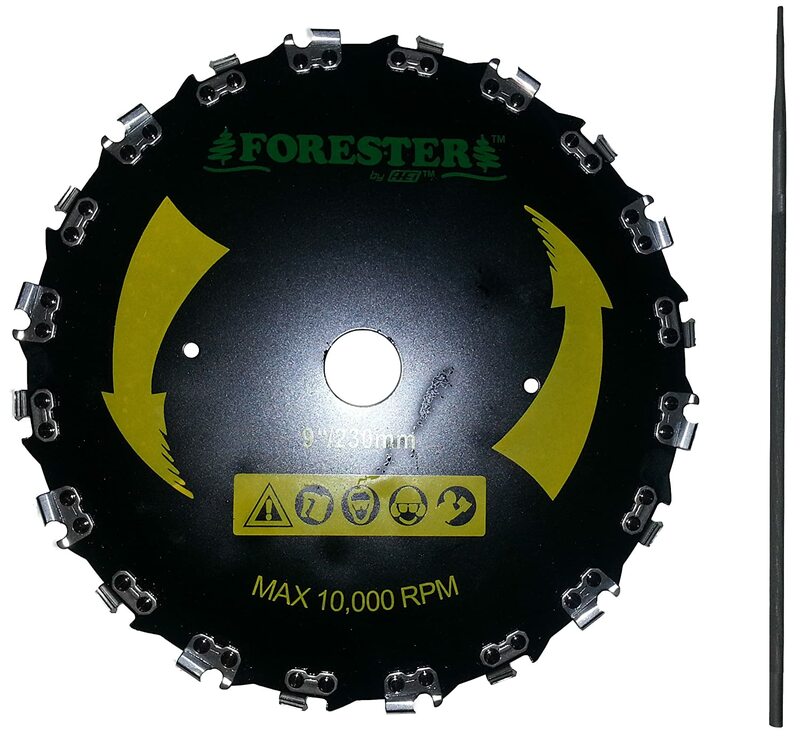 Brush cutter blades are typically made of carbide – a significantly stronger metal than steel. This gives it the hardness to deal with any plant that may come its way. The metal is also durable. Brush cutter blades are easy to replace whenever necessary – some blades can also be attached to trimmers making them pretty versatile. 1 Why is a Brush Cutter Blade Necessary? 2 How are Brush Cutters different from Trimmers? Why is a Brush Cutter Blade Necessary? They are sharp and strong enough to deal with the overgrown brush that a trimmer or even a lawn mower has a hard time with. The carbide steel they are mostly made of ensure they stay sharp throughout and sufficiently hard to deal with various types of vegetation. Brush cutters allow attachment of different blades. This provides the versatility of dealing with different materials. If proper maintenance is provided, the blade offers long-term benefits. Their portability and reach is another thing worth writing home about. Brush cutter blades can access those hard to reach spots with lawn mowers and tractors. They are also a safer alternative when cutting weed and brush close to fence lines. The cutters can also work on really steep slopes – really steep where the mower can easily tip over. How are Brush Cutters different from Trimmers? Brush cutters may look similar to trimmers but are quite different, to say the least. They may also seem interchangeable, but nothing could be further from the truth. The jobs that each of them can comfortably accomplish is where the difference comes in. The most significant of the differences between the two machines is that string trimmers utilize a nylon cord as the cutting tool. Even though the head can easily be interchanged with a steel blade, their power is not up to the task of continued usage. A string trimmer is ideal for clearing small and medium-sized weed in areas around fences and obstacles that a mower would not dare reach. In contrast, the brush cutter uses a steel blade to sweep small saplings and thick weed. It has the power to complete the task sufficiently and a harness for bearing some of the weight. The more the teeth, the better the final cut. A plain blade is for light tasks but is not recommended. They tend to get blunt much more quickly, and their capacity is not what you would call ideal.Anything between 30 and 40 teeth is adequate. It has the efficiency to subdue the invading brambles and unsightly brush.Above 80 teeth is ideal for pruning and keeping the foliage under wraps. However, you will need to determine how you are going to use the blade before you can finally purchase it. 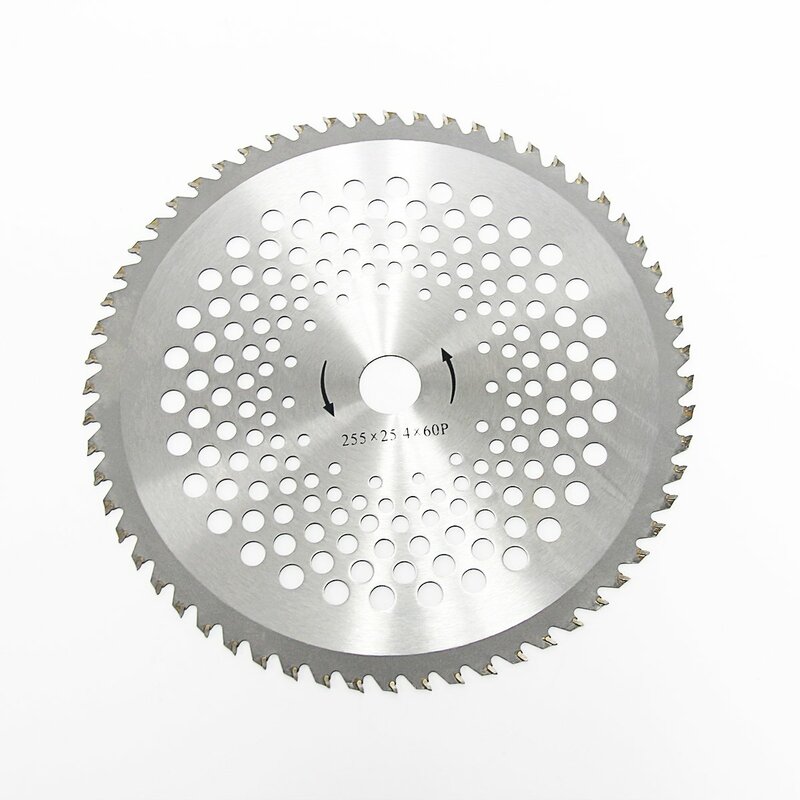 The arbor hole is where the blade is attached and come in various sizes. To avoid problems later, make sure to check that the hole size on your model is adequate. It is critical to get the blade attached right for safety. The majority of brush cutters are constructed of steel. Depending on the type, steel ranges from top quality to cheap options but we all need the best quality, and that includes something like carbide steel. The high-quality steel may not be entirely cheap but are worth every bit of investment. The bigger the blade, the more power the cutter packs. In other words, bigger blades need a more powerful machine to spin and vice versa. And if a blade is not spinning at optimum speed, then the risk of dangerous recoils increases. This is never ideal.Blades come in three standard sizes: 8, 9 and 10-inch. Before you choose one size over the other, think carefully about the intended purpose. Carbide steel has an unmatched level of durability and is among the best you get with this brush cutter. Carbide lasts up to ten times more than steel and is not as expensive – an excellent value for money. But the main benefit of getting this over others is the high compatibility level – it comes with attachments that make the blade fitting for any brush cutter. 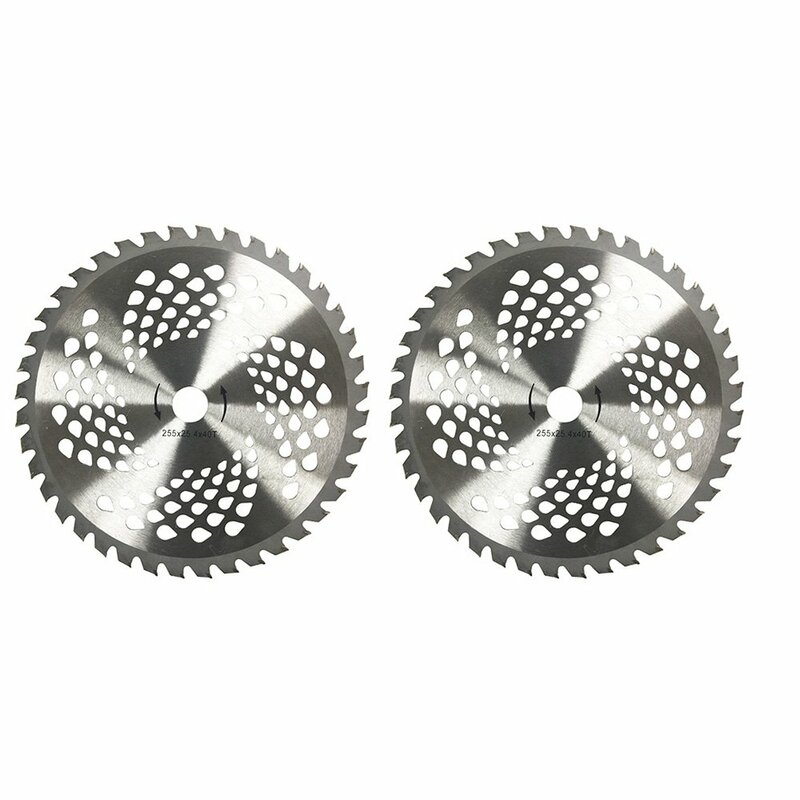 This blade comes with 25.4mm and 20.0mm arbor sizes for a tight and comfortable fit. 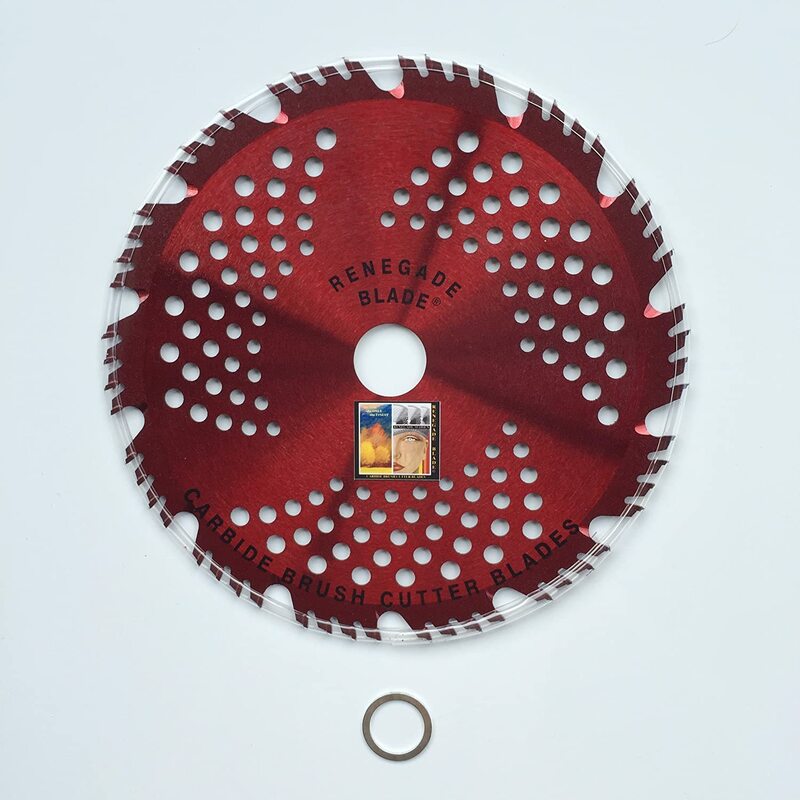 This is another carbide-made blade with a universal fit – it is both durable and fits a variety of machines. The blade is 8 inches in diameter and comes with 80 brazen-welded teeth making it one of the most efficient. No one fancies having an attachment that is hard to fit but this one has all the right accessories for a comfortable attachment. This product comes in a combo of two blades and is a universal fit. However, you will need first to acquire a blade kit. Note that the blade will not fit on a string spool axel – not ideal. Regardless, the cutter blade flaunts some top features that earn it a prime spot among most reviews. You acquire the forester in a bundle of two – the 9-inch and 3/16-inch. This pretty much affords you a choice. The blade supports a maximum speed of 10,000 Rpm – sufficient to attaining efficiency. And to ensure that the blade is always ready to go, it is accompanied by a sharpening file – not many products include this useful accessory. Please note that you will need to have safety equipment when using the blade – prevention is always better than cure. The ideal brush cutter has a durable carbide tip and more teeth for durability and optimal performance. 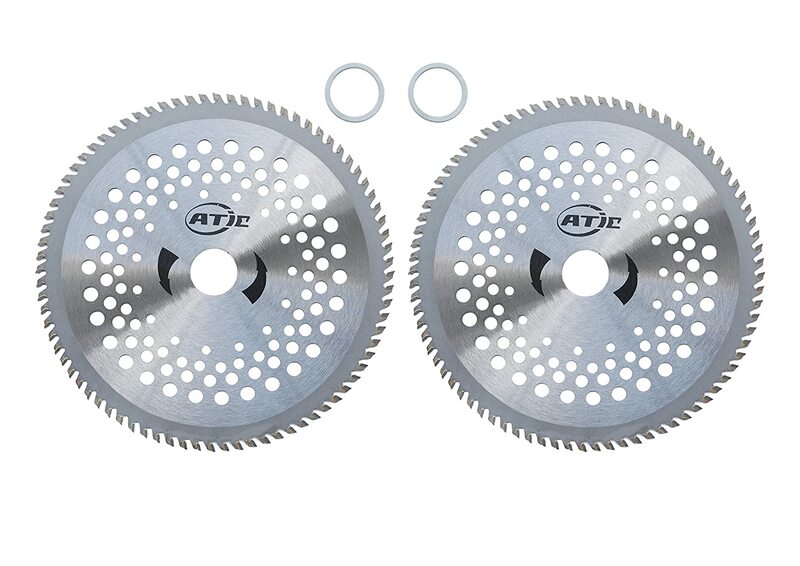 Its arbor hole is 25.4mm with a diameter of approximately 10” – the hole may be a little large for some of the grass trimmers but acquiring an adapter will remove this shortcoming. No doubt brush cutters make your task of clearing the bush and other undesirable weeds and saplings pretty easy. However, you need the best brush cutter blade to go with it – these things are complementary. We have taken the trouble of reviewing some of the best blades on the market to make your life a tiny bit easier when shopping and when clearing the field. Our top choice is the GST-RAZOR — COMBO Hybrid Specialty Brush Cutter Blade. Its compatibility with other trimmers are pretty high, it is sufficiently broad and also has a large number of teeth for efficiency and durability.